Alice K. Dade enjoys a career of great variety including concerto and chamber music appearances, recording projects, television appearances, and guest principal performances with orchestras in Asia and Europe. As a soloist, Ms. Dade is an award winner of the Olga Koussevitsky Wind Competition of the Musicians Club of New York and the New York Flute Club Competition. She has appeared as soloist withthe Metamorphosen Chamber Orchestra, Festival Mozaic Orchestra,the Guanajuato Symphony Orchestra (Mexico), Orquesta Sinfónica Juvenil Red de Escuelas de Música de Medellín (Colombia), and PRIZM Festival Orchestra. Ms. Dade has performed chamber music as part of the Busan One Asia Festival, Chestnut Hill Chamber Series, Festival Mozaic, Concordia Chamber Players, the Princeton Festival, and Summerfest of Kansas City. She was an artist faculty of the Medellín Festicámara, a chamber music program for underprivileged young Colombian musicians. As Acting Co-Principal Flute of the Swedish Radio Symphony Orchestra, Ms. Dade performed in concert tours of Russia, Germany, Italy, Belgium, and Sweden. She has also performed as Guest Principal Flute with the Bergen Philharmonic, Norrköping Symphony Orchestra, and Seoul Philharmonic, as well as Guest Piccolo with the St. Louis Symphony. In addition, she has performed with the Moscow Chamber Orchestra, New York Philharmonic, Los Angeles Philharmonic, and Detroit Symphony Orchestra. Ms. Dade can be heard on Deutsche Grammophon as Principal Flute of the Swedish Radio and on Arte Verum as Flutist and Piccolo of the Swedish Chamber Ensemble with soloist Barbara Hendricks. Her first solo album, Living Music, was recorded at Skywalker sound and released in February 2018 on Naxos. Ms. Dade is a recurring guest star of a new PBS series called Now Hear This. Now Hear This explores the secret histories of the greatest musical works and their composers, while discovering connections to today's music, art, and culture. Ms. Dade joined the faculty at the University of Missouri School of Music in 2011 and has presented master classes at Inje University (South Korea), the University of Guanajuato (Mexico), Vanderbilt University, Penn State University, and the University of Kentucky. She has been a faculty member of PRIZM International Chamber Music Festival and the Flutes by the Sea Masterclass. A columnist of Chicago Flute Club's quarterly Pipeline Newsletter since 2010, Ms. Dade has also been published in Flute Talk Magazine, The Instrumentalist, and The Flute View. Alice left her childhood home at the age of fifteen to attend the Interlochen Arts Academy. Upon graduation, she attended the Juilliard School for undergraduate and graduate studies, where she studied with Carol Wincenc, Robert Langevin, and Sandra Church. 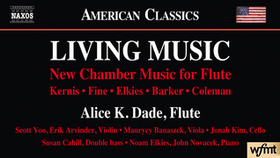 Alice K. Dade has released the long anticipated - Living Music on Naxos. An album of new chamber music for flute, Dade is joined by pianists John Novacek and Noam Elkies, along with Scott Yoo, Erik Arvinder, Maurycy Banaszek, Jonah Kim, and Susan Cahill of Festival Mozaic. Recorded at Skywalker Sound - Living Music producer is Leslie Ann Jones, engineer - Dann Thomas. As a companion to the music album, Dade appears in a series of short films that we will be distributing to media and local radio. These segments include conversations with each composer about approach, inspiration, influences and motivations. Contemporary music is alive and well in innumerable forms and genres, and the flexibility and colorful sonorities of the flute have attracted composers of every style. 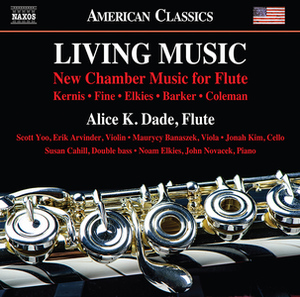 This collection of beautiful chamber music with flute is performed by award-winning soloist Alice K. Dade and includes four premiere recordings. These take us from Aaron Jay Kernis's Air, the composer's ‘love letter in music,' via the youthful memories of Michael Fine's Skipping Stones, the Baroque and jazz elements in Noam Elkies' E Sonata and the breathtaking mountain scenery of Jennifer Margaret Barker's Na Tri Peathraichan, to the novel and mysterious musical mirroring of Dan Coleman's Pavanes and Symmetries. Alice K. Dade's - Living Music is the WFMT: Chicago 'Featured New Release' for May 17, 2018.